The very start of any program is immersion. The result of immersion is integration with the people, thus, intensifying solidarity with them. Later on, scientific data gathering was conducted. The result of the survey states that they have so many concerns. But we started with housing then livelihood, health, education and values formation respectively. At least, each program is now taken charge of by certain persons such as: education � Hernan, health � Max, Values formation � Ranier, Livelihood � Mely, Housing � Fr. Dexter. However, all of the programs are under the supervision of Fr. Dexter. 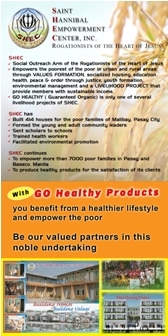 SHEC was registered in Securities and Exchange Commission last July 28, 2005. This makes it easier to relate with other funding agencies. 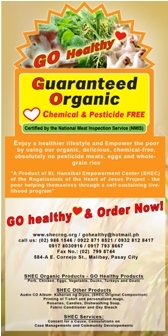 SHEC uses several ways to promote her spirit. First, living out the causes of� SHEC. This has inspired people who are coming over to SHEC. Secondly, sharing by teaching the biblical and charismaric foundations of SHEC to Religious Brothers, Rogationist novices, Aspirants of the Daughters of Divine Zeal, volunteers� has made SHEC attractive as a way of finding fulfillment in life. 5. Formal settlement of the status of Max, Hernan and Ranier in order to give what is proper to them. While preparing for his ordination to the priesthood, he was finishing his course in Bachelor of Science in Social Work. Right after graduation, he was asked to prepare for the establishment of SHEC. At the first year of setting up of SHEC, he finished his degree in� Masters of Arts in Theology. At present, he is in his full-time work of empowering around 2000 informal settlers of the six barangays of Pasay City. In agreement with the Major Superior, Ranier is in the process of intensive discernment. He found SHEC to be the best place for him to process himself. While in SHEC, he is in charge of the value formation of the members of� St. Hannibal Christian Community. Initially, he is expressing his desire to continue his studies in Don Bosco by next school year while staying in SHEC. He left the Rogationist Novitiate some time in November (2004) last year due to certain personal reasons. With certain arrangement with Fr. Bruno, he wanted to express his desire to go back. In search of a community, he found SHEC to be the place for him to continue his discernment. He came over to SHEC last June 2005. Right now, he is in charge of educational and scholarship programs of SHEC. He was a former Rogationist Senior Seminarian. After one and a half years of staying in Green Court, where the formation was first held, he went outside to finish his studies. When SHEC was just starting, he came to know about it. He came over and expressed his desire to go back because he was attracted to the kind of apostolate that the Rogationists have at present. That was in May 2004.� While staying longer in SHEC, Fr. Bruno arranged with Fr. Dexter that he has to finish his course on Economics in almost two years. After that, he has to go to Calcutta to pursue his postulancy together with the other senior seminarians. Right now, he is assisting in the Health Program. She is from Baguio City. She finished her bachelor�s and master�s degrees in economics in Baguio City. She has also further studies in Germany in relation to her course. After her studies, she worked in National Economic Development Authority (NEDA) for almost ten years in technical positions as economic development specialist. Afterwhich, she worked also in other agencies with almost the same line of work. To further on her knowledge, last year she took up Bachelor of Science in Social Work in Asian Social Institute. While studying, she came to know SHEC and was attracted to the work. After graduation, she came over� and expressed her desire to work as a full-time collaborator. She started just last June 2005. She is now in charge of the livelihood program. 4PM � meeting with the religious bros.